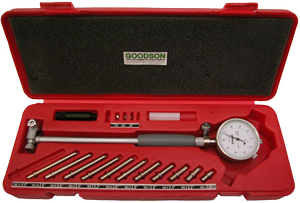 A dial or vernier bore gauge directly measures a cylinder bore. Many dial bore gauges are self centering and will give readings as accurate as to within one ten thousandth of an inch, if a high quality dial indicator is installed in the gauge. Measurements are taken at the top and bottom of the cylinder bore both perpendicular and parallel to the centerline of the motor. 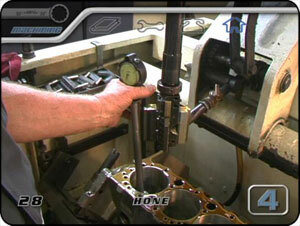 Here the machinist is inspecting the cylinder bore diameter with a dial bore gauge. This is used after every honing stone is run to bring the bore size to spec.